What are the navigation techniques used to handle the aggregated unknown effect of gravity from local and distant matter for the New Horizons space probe when it intercepted Ultima-Thule ? I am thinking there will be local invisible matter that we cannot observe and therefore cannot account for in the navigation procedure. Course changes from unknown objects will be tiny. We detected MU69 from Earth, and it's only 30 km across. So 'matter we cannot observe' is going to be smaller than that and be too light to make much of a difference in NH's course. 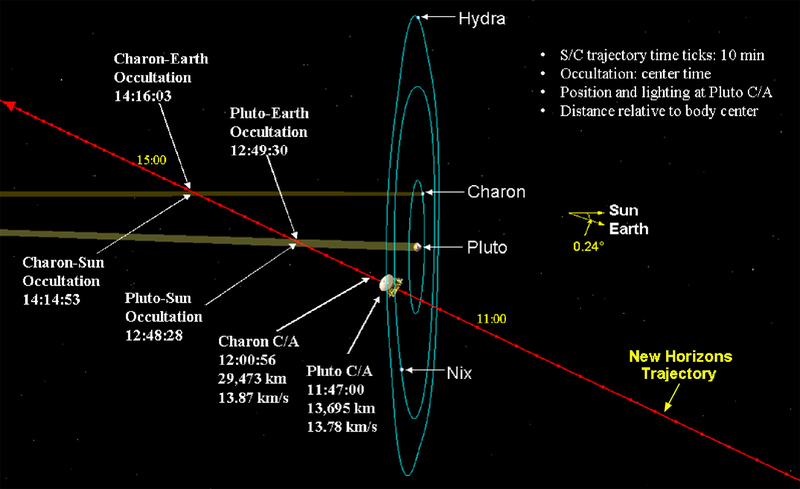 To give an idea of how big an object would have to be to change NH's course significantly: at Pluto, New Horizons' velocity vector was adjusted by only 21 km/h, and that's with a flyby at 10,000 km from a planet 2200 km in diameter. Any course changes large enough to cause a problem will show up in the high-precision position measurements we make of New Horizons. Essentially none. The flyby of Pluto was very close to a straight line trajectory. See the image below. Pluto's mass was too small to have any significant effect on New Horizons' trajectory. The effect was observable after the fact, about 6 meters per second $\Delta v$. Since Pluto's mass is several hundred thousand times that of Ultima Thule's, the effect of the flyby on New Horizons' trajectory will be very close to nil and may well not be observable at all. New Horizons has extremely limited onboard translational guidance, navigation and control capabilities. All maneuvers are planned on Earth and transmitted to New Horizons. The ground systems command New Horizons to orient itself to a specific attitude with respect to the stars and at a specific point in time, fire its thrusters until it attains some commanded $\Delta \vec v$. Though there is a minimal impact on trajectory from the matter around the New Horizons spacecraft minor corrections can always be made with the limited monopropellant supply on board the craft. Did the Pluto flyby give New Horizons any significant gravitational boost?